Share the magic of Christmas with silver embossed stars and feathers in a turquoise color. The interchange of stripes covered with Creative Medium and the stamped tracing paper with VersaColor add depth to the background and give a sense of a screen. The multiple layers of the Creative Medium used and then heated, create a rough texture on the paper. Cover a piece of watercolor paper at least the size of the card will be used with Creative Medium Iridescent Turquoise. Use a heat tool to dry and overheat the paper. The Creative Medium will start making baubles. Repeat the process at least 3 times to give the surface a rough look. Cut stripes of the watercolor paper in various widths and in 6 inch long (one inch less than the card used here). Stamp the tracing paper with the swirls design of the stamp set and the VersaColor Turquoise ink. Cut strips of the stamped image in various widths and in 6 inch length. Use Tear It! Tape to set the watercolor and tracing paper stripes on the front of a card base. On a piece of watercolor paper, on the smooth side, color with the VersaColor Turquoise and Celadon ink pads. Stamp with VersaMark the same stamp design as above. 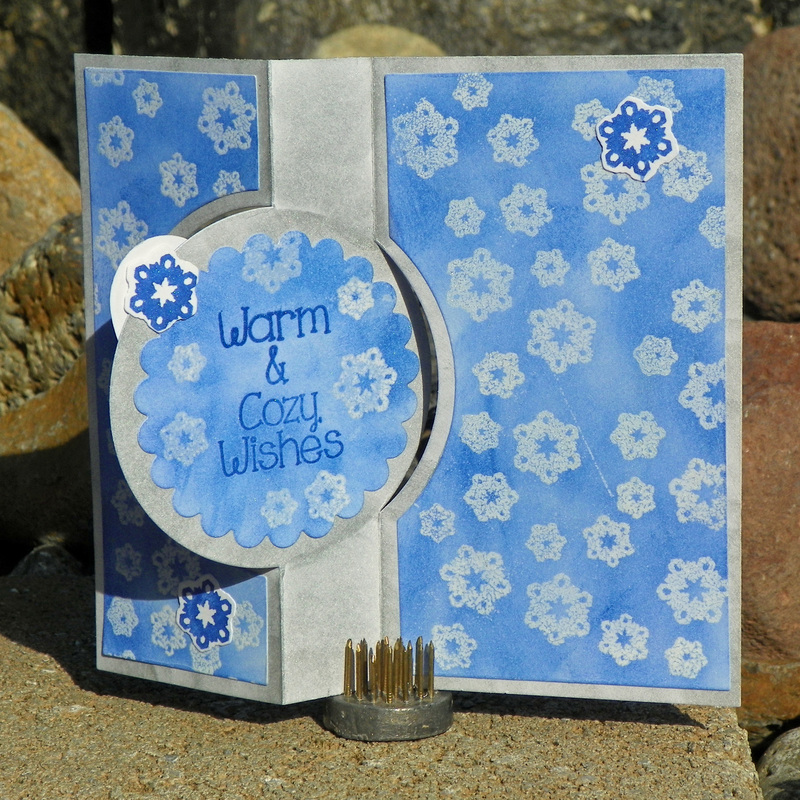 Cover with Imagine silver embossing powder and heat set. Die cut stars in different sizes from the embossed paper. Make a circle of the craft wire, glue with hot glue and continue with the feathers. Use the On Point Glue to place the paper stars, while the main star, set it with some foam tape to raise from the front. Add rhinestones with the On Point Glue. Remove the words from the sticker and set them on a piece of tracing paper and then glue on the card. It’s time to get ready for the holidays! Today Melissa creates a gorgeous watercolor background with Memento and VersaColor Ink. She finishes her holiday card with gorgeous gold embossing powder. This is a quick and easy holiday card that can be mass produced for sending to loved ones this season! Red Sangria…brings to mind a deep rich red with swirls of light and dark from the various fruits floating in its depths. When I found out that’s what the color of the month was for August I instantly knew I wanted to try to re-create that luscious color kaleidoscope. I think that this faux marble technique is just the ticket. In this project, I have created Artist Trading Coins and a holiday or Christmas card. This inky marbled paper background can be used in multiple papercraft projects. For this technique to work you must use bristol cardstock. Regular cardstock will soak up the ink too fast and won’t create the depth and texture needed for this technique to be a success. Add a few drops of Rose Pink All Purpose Ink into a mini squeeze bottle with a microtip. Add one drop of Ink Potion No.9 solution to the bottle. Give it a quick shake to mix it up. Apply several drops of the mixture onto a piece of bristol cardstock; smoosh the ink around with an acrylic stamping block and let dry. Add one or two drops of Thistle All-Purpose Ink to the existing mix and give it a shake to integrate the new color. Sprinkle several dots of the current mixture over the cardstock and smoosh it with the block; allow inks to dry. Next, add 2 drops of Red Delicious All-Purpose Ink to the mix and shake. Sprinkle dots of the mix over the cardstock; smoosh and let dry. Continue to add 2 drops of Poppy Red All-Purpose Ink; mix, sprinkle & smoosh. Then add 2 drops of Wisteria All-Purpose Ink, mix, sprinkle & smoosh. Each layer of ink you add will create more and more depth of color and “texture”. Finally, add one drop of Real Black All-Purpose Ink to the remaining ink mixture and sprinkle just a few drops over the piece; smoosh with the acrylic block and let dry. Arrange marble stamps on a stamping press and ink with Golden Glitz Delicata Ink. Close the press and stamp the inked panel. Repeat as necessary to get a good image. Reposition the inked panel and stamp until the entire panel has been stamped with the marble texture stamps. You will be left with a beautiful deep rich red sangria marbled cardstock ready to spice up any project. Once you have created this beautiful inky backdrop then get creative on collage themes like this in the photo above. I cut out the image of a woman and the word “queen” to make this piece. For this holiday card, I have used the inky paper to create two panels that open in a double door style card. Are you making last minute Holiday cards? Check out these two handmade papercrafts by Tenia and Martha. Martha uses a shadowing technique to create a dynamic look and Tenia shows off lettering talent and creates a bright and glittery card using Memento markers. Hello everyone! If you don’t know I live in Florida and snow for us is only on cards, photos or when we travel during the winter. 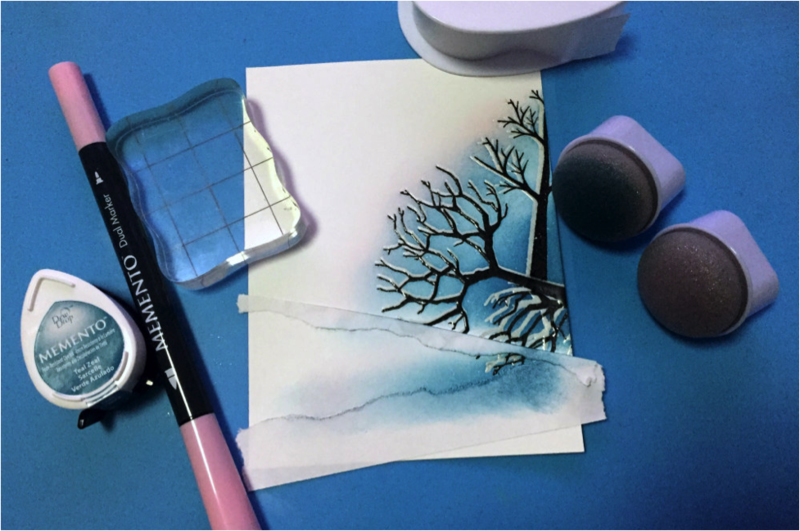 Today, I used my entire imagination to create a Snow card and you will be surprised when you find out what I used to make my card. 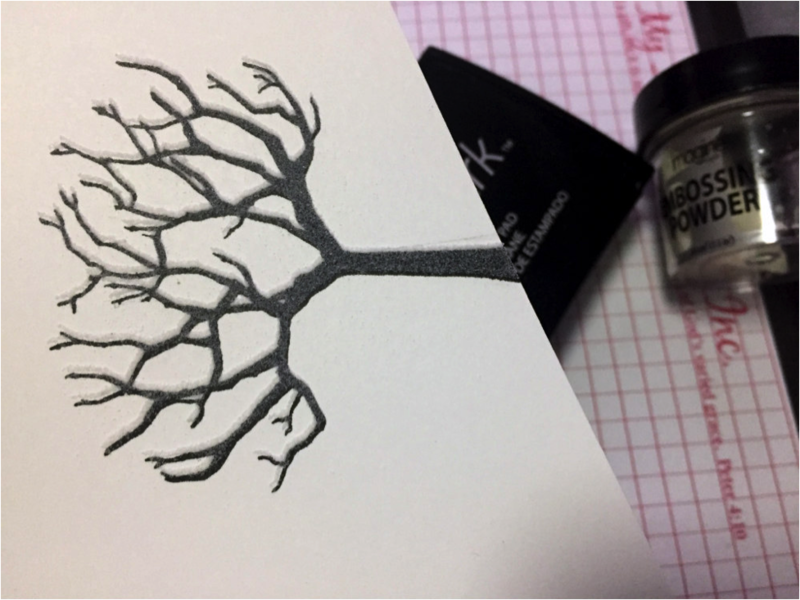 I stamped the branch using VersaFine Onyx Black. Then using the Misti, I stamped again the image in VersaMark slightly above of the black image. I combined two different images to create the scenery because I don’t have a single image in all my stuff that offered me that I wanted…can you believe it! I have imagination and I applied some ink with a Memento marker Angel Pink over an acrylic block and applied the ink with a sponge dauber around the sky to create the perfect contrast. To finalize the card I stamped the sentiment from the stamp set Bright All Night using VersaFine Onyx Black and pasted the stamped layer over a Whisper White card base using Tear It Tape. Tenia here from Jazzy Paper Designs with a very cool hand lettering project made with Tsukineko Memento Markers. 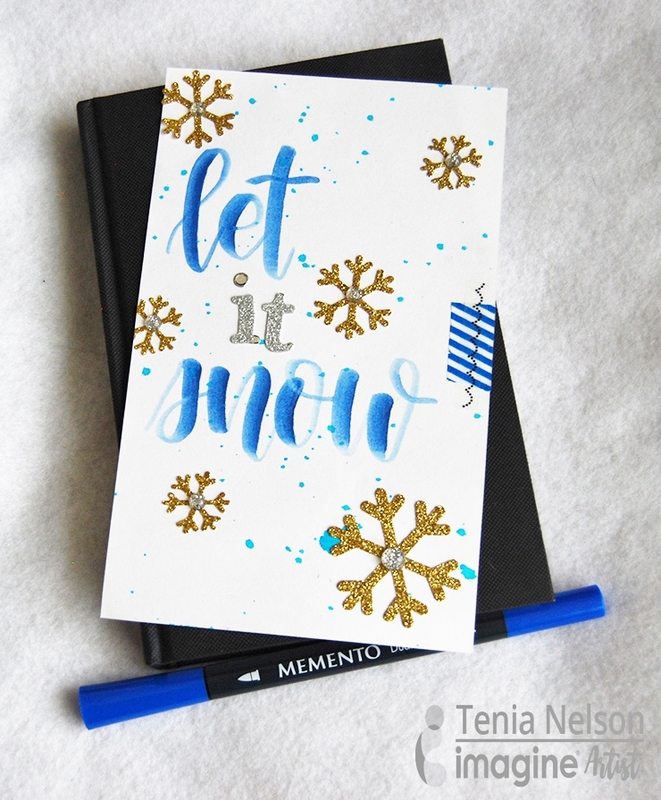 Dip marker into shimmer spray(to create an ombre effect) and hand letter “Let” and “Snow” in large letters on a piece of cardstock. Add Fireworks in Bahama Blue splatter to paper. Add the word “it” from sticker letters. Add the rest of the snow themed embellishments and washi tape. This simple and easy project could be mounted onto a cardbase or can be used as party decor. 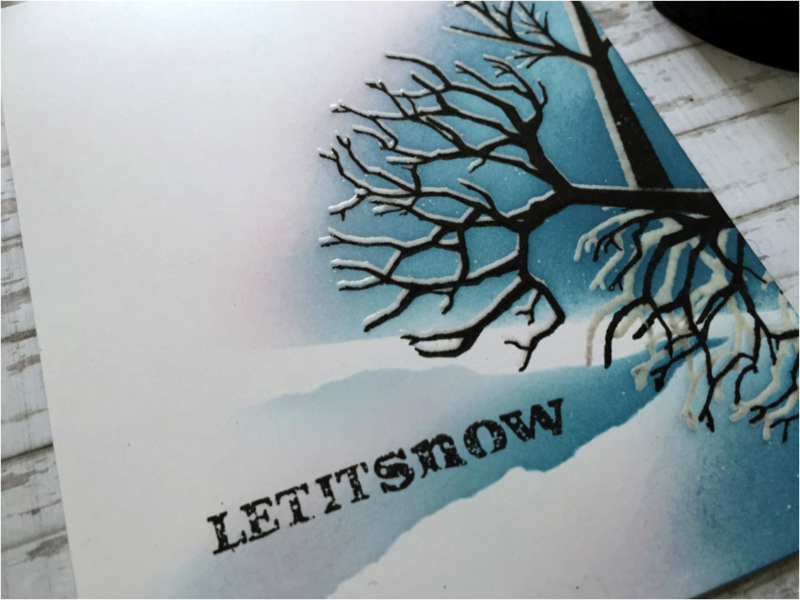 Delicata is the perfect ink to create a Let It Snow Flip card, or in my case Warm & Cozy Wishes while surrounded by snowflakes! In order to make this card, you will need the Sizzix Framelits Flip Its 660022 or one similar to it from Sizzix. There are several video tutorials on how to use this die and once you have a handle on how to construct the card then the rest is easy! The mittens and cuffs are stamped and heat embossed with clear embossing powder and die cut, then placed over the stamped mitten image. The snowflake background is created by stamping with Delicata White Shimmer and heat embossing with clear embossing powder. Delicata Sapphire Blue is applied over the entire area with an Ink Blusher then the ink is buffed off the images with a paper towel. The background behind the mittens and the small snowflake die cuts are simply stamped in Delicata, the shimmer of the ink does the rest! Ink blusher applies ink around the edges of the card in Delicata Silvery Shimmer, and behind the circle in Delicata Sapphire Blue. By using just three Delicata inks, a bright and beautiful coordinated flip card is fun to create. I hope your holidays are warm and cozy! A few years back a card making blog challenged us design team members to create Christmas projects using standard, non-Christmas themed supplies. After some desperate moments, I started taking new perspectives to the stamps I already had in my stash, and soon realized how rewarding it was to discover new and unconventional ways for using them. 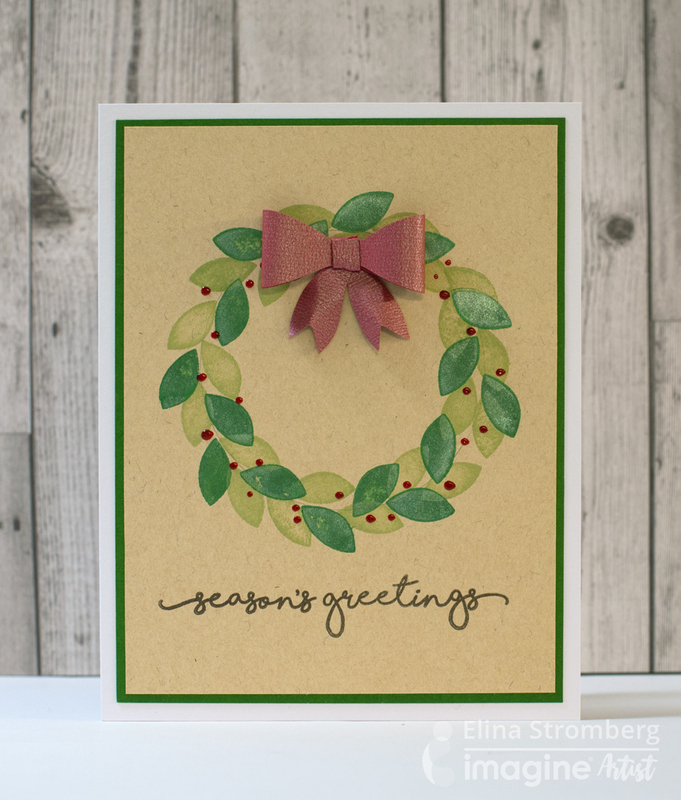 This Christmas card is a continuation of that challenge idea: Instead of using a holiday wreath stamp, I draw a circle on craft cardstock, stamped leaves around it using a simple flower leaf stamp, and decorated the card with a hint of liquid red ink and a punched paper bow. The end-result looks yet quite Christmassy, doesn’t it! I also punched two gift tags and used the same technique on those. So simple and easy to make! 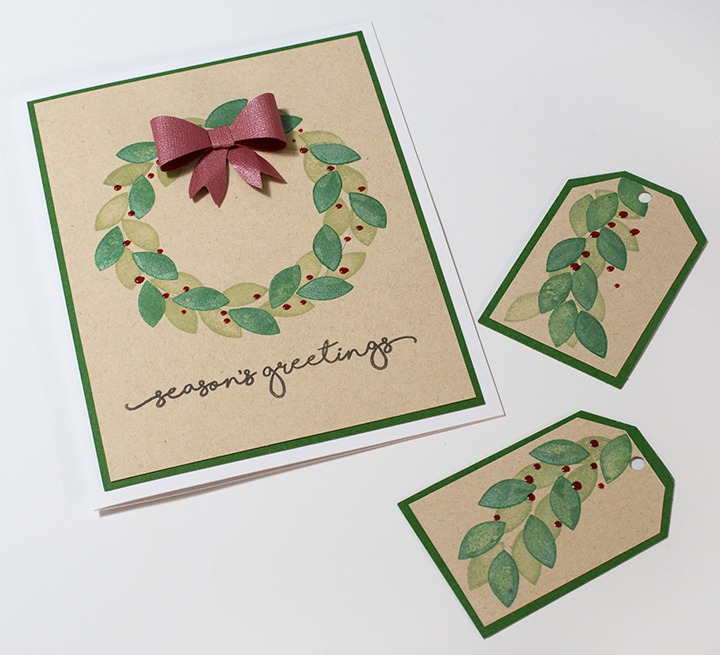 The metallic shimmer of the Emerald Green Delicata ink made my card look even more festive; it’s all in the details!